With the arrival of my aunt from New Zealand, I thought easy fish pie was something I could prepare ahead of time and just stick in the oven when I needed it. Now, this is barely a recipe as it involves very little cooking and much more assembling. So it’s more of an exercise in purchasing and emptying than actual cheffy finesse. However, if you are short on time and have finally realised that sometimes the shop-bought stuff is actually better, then this is the recipe for you. The Mother-in-Law has actually asked for this recipe, which was a test in truth or dare. Do I dare tell her I whipped it up from scratch from my own intuition or do I tell the truth – it all comes from Waitrose and I merely plopped it in the dish….Anyway, back in the days when toast was a challenge I would have loved this ‘recipe’! Get about 500g of fish pie mix from the fish counter. This is nicely skinned/boned chunks of cod, smoked haddock and salmon. Put them in the bottom of a lasagne dish and scatter a handful of frozen, shelled prawns over the top. Next empty the contents of a large tub of cheese sauce over the fish and stir it through carefully. Sprinkle some frozen peas over the mixture and set aside. Make up a good wodge of mash – I use about 8 medium potatoes and mash it with a large knob of butter and some whole milk or single cream. Mash and mix until it is creamy and not stodgy. If you’re feeling a bit ‘Abigail’s Party’ you can put it in an icing bag and pipe the mash on in stripes using a big Mr Whippy nozzle. Or you can just plonk it in the middle of the dish and spread out carefully until all the fish mix is covered. Grate a knob of cheese over the top and sprinkle with a tsp of paprika (not as much as I put on in the picture…slightly heavy-handed and got it in my coffee, which was an interesting taste…pepped it up a bit!). Then bake in the oven at 180ºC for about 45mins. If the top looks like it’s burning, lay a piece of foil over it. Hey presto! 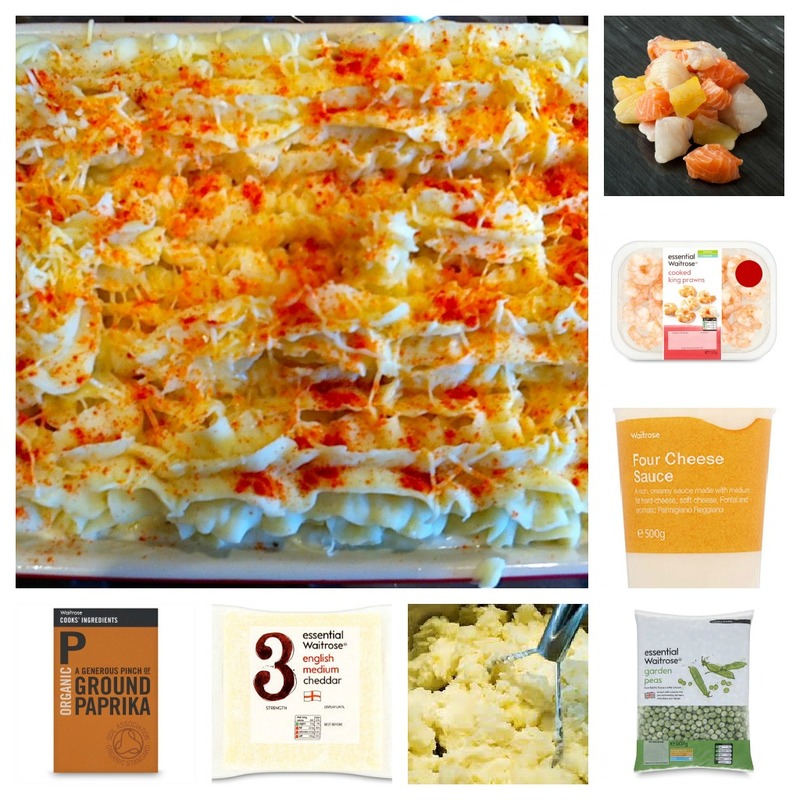 Very easy, very cheaty but very tasty fish pie! Costs about £12 to make and feeds 4 hungry adults or 6 modest ones!